Photo 1. This picture appears in the revised version of Leslie Cabarga's The Fleischer Story, but Cabarga mistakes the location for outside 1600 Broadway in Manhattan. Al labelled this photo 1929, Long Island City, and the studio was in Long Island City for most of 1929 before moving back into Manhattan. 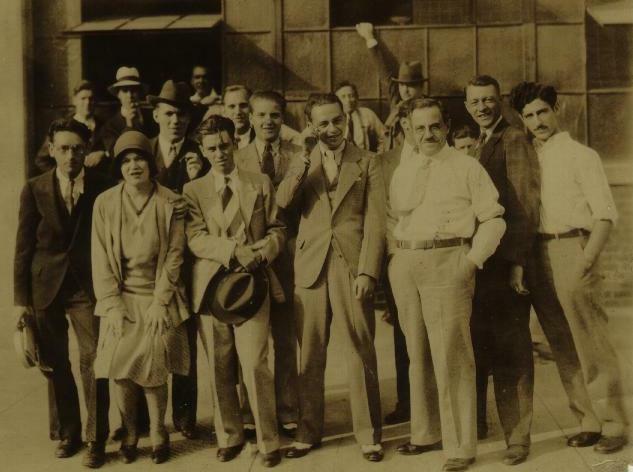 Front row, left to right: Possibly Sidney Wallick, Edith Vernick, George Cannata, Seymour Kneitel, Max Fleischer, Charles Shettler, Sid Marcus. Al Eugster is behind Vernick and Cannata, with his hat and cigar. Standing behind Cannata and Kneitel is Abner Kneitel. Standing behind Cannata and Abner Kneitel is George Rufle. In the background at left, wearing a white hat, is Rudy Zamora. In the distance behind Seymour Kneitel is Joe Fleischer, with suspenders. To the right of Joe Fleischer, with his hand on the window and wearing hat, is William Henning. In the distance between Max Fleischer and Charles Shettler, you can see the top of Bill Nolan's head. Photo 2. 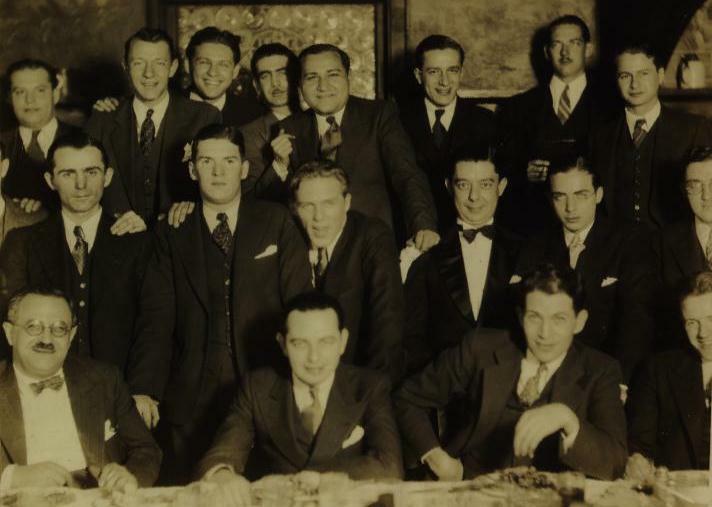 A Fleischer Studio gathering in 1931. Seated left to right are Max Fleischer, Seymour Kneitel, Roland Crandall and unknown. Standing behind them are Frank Paiker, Willard Bowsky, Al Eugster, Ugo D'Orsi, Reuben Timinsky and possibly Dave Tendlar. Back row: Sam Stimson, Charles Shettler, Sam Buchwald, unknown, Izzy Sparber, Tom Bonfiglio (who later changed his name to Goodson), Ralph Sommerville, Myron Waldman. The man just left of Sparber is also in the beach picture below. Photo 3. 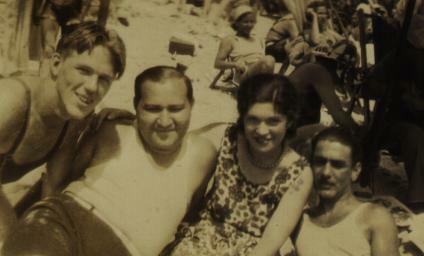 At the beach in 1931. From left to right: Al Eugster, Izzy Sparber, Edith Vernick, unknown. The unknown man is also in the picture above. Who is he? Photo 4. In this 1931 photo, Tom Johnson is second from left. The man holding the cigarette in the center is a Paramount publicity man. Al Eugster is holding the napkin in front of him in the right half of the photo, and the next face visible to the left of Al is Al Windley of the checking department.